White glassine bags are the perfect party favor and candy bar bag. You can decorate them with smear proof ink, stickers, or leave them blank. The bags are semi-opaque. This means you can somewhat see through the bags, but not completely. 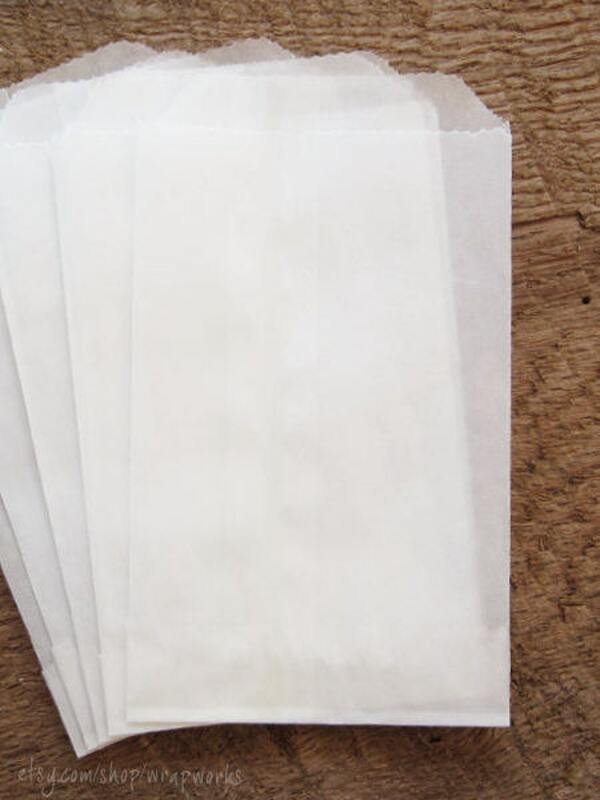 Glassine paper is just regular paper that has been pressed and rolled until shiny, dense and thin (yet strong). Our glassine bags are multi purpose, and also FDA approved for use with food. They are perfect for snacks, party favors, small boutique or bakery items, food safe liners for other bags, and sample bags. You can also use them for storing stamps, scrapbook findings, stickers, beads, or other small objects. Each bag is 4 x 7.5 and lays flat like an envelope - no gussets. Items are as described and super fast shipping! UPDATE: These bags are not grease resistant. I put coffee beans in them and one day later there were grease spots all over the bag. I now cannot use them. Paypal or Credit card through Etsy's secure servers. We love Paypal! Damaged and 'wrong' items received will be replaced. Contact us and we will send a pre-paid return label for those. You can mail back to the address on the return label. Please send us a convo letting us know that you are returning them so we can keep an eye out for them. ✔ Orders are generally shipped same (if ordered by 12pm EST) or next business day, Mon-Fri. Please convo us immediately if you need an expedited shipping upgrade! International customers, please read everything below for important info about DELIVERY TIMES and TAXES. If your shipping total is under $5, your product(s) is/are usually mailed by first class mail, which has a 2-5 day delivery estimate. Expedited shipping is available, and is to be paid for prior to shipment. So please do not include a message asking to upgrade, and then 'disappear'! ;) We do not have access to your credit card and can therefore not charge your card ourselves. - Priority mail shipping rates start at $6.35. If your shipping fee is at least that amount, expect your package to be delivered by Priority Mail in 1-3 days. Very heavy orders may be shipped by FedEx Ground. - First class mail generally has a 2 to 2 1/2 weeks delivery estimate. - Priority Mail starts at $25.95 and should cut your time down to 7-14 business days. All mail from USA-Canada is trackable. - Please allow for 14-45 days for first-class mail delivery, depending on where you live. Packages sent first class do not have tracking. - Priority Mail starts at $31.95. If your postage(-total) is at least that amount, your order will LIKELY go by Priority Mail, which has a 7-14 day delivery time. NOTE: If you live outside of the USA, you may have to pay duties or taxes* when you receive your package. We cannot collect that fee, nor can we advise you on how much you may owe. Please check with your local post office and/or postal services if you have duties-/taxes-related questions. We collect sales tax for Tennessee orders.